We want this reflected in our relationships, our family, and for this to be at the forefront of our business, the products we provide, and those we partner with. AND WE WANT YOU TO PARTICIPATE WITH US. We partner with companies and people who are already living the BE STRONG, PROTECT THE WEAK, LOVE EVERYONE message. We also want to come alongside and employ individuals who need extra help, a second chance, a place to shine. SOX PLACE MOTTO: Changing the lives of Denver’s street youth, one t-shirt at a time. 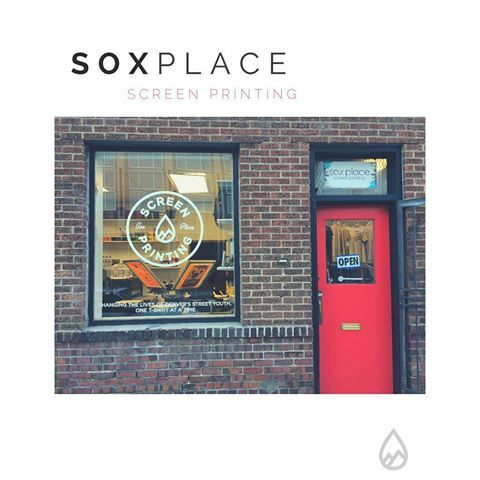 Sox Place Screen Printing provides employment and job training opportunities for homeless and at-risk youth through one-on-one mentorship, allowing them to gain job and life skills that can be utilized to break the ruthless cycle of homelessness. Revenues generated from screen printing services are used to directly fund Sox Place – a homeless youth drop-in center that provides food, clothing, shelter, and meaningful relationships to the street youth of Denver. Our desire is to partner with companies or individuals who give back to others. JEWELRY: We are partnering with BRANDED COLLECTIVE for our November launch. They exist to empower survivors of human trafficking through meaningful employment and economic independence. Many victims of human trafficking are BRANDED; their captors physically mark them with a number or symbol. The process is often violent: a forced tattoo, a burn or knife cut. The BRANDED Collective stands against this brutal practice. Each BRANDED item is stamped with an initial and a number. The initial belongs to the survivor who made your cuff. You can read her story on our website. The number is your unique number in the Collective. You can register this number and send a Message of Hope to our survivors. HOME GOODS: As we continue to develop our home goods line, we our partnering with those who have amazing talent and need employment. Many times we will select a specific day of our launch when we give back one-half of our profits for that day to celebrate an organization that is living this message out in their community. Here are a few we have celebrated. As we continue to grow we will continue to add others.